There was a story in the Old Testament that made perfect sense to me. I could totally relate to it. I needed no interpretation. 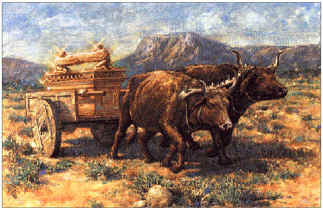 The Philistines were trying to work out how to send the Ark of the Covenant back to Israel. They decided to do an experiment. They got two milking cows that had never been tied to anything. They had also just had babies. These were full time, free spirited motherly types. Their udders were full. Their babies were taken from them and locked in a shed. The test was for them, their mothers and God. He was going to have to change the instincts of the mothers. The mothers were either going to obey God or not. The babies were going to have to find new udders or get used to formula. Whatever happened, the Ark was going to have to go in the right direction. The babies bellowed. For a moment it seemed that the “prone to wander” cows were going to turn around and bolt home. They didn’t. Maybe they had heard the story of Lot’s wife and didn’t want to turn to salt. They just put their heads down and took the yoke. At least they had each other. Going against their natural instincts, the mothers obeyed God and walked in the direction they were supposed to go. They didn’t look back. They stayed on the road and didn’t stop to eat or drink. They just kept on walking. Their pain must have been great. The storyteller doesn’t leave out the details. “They walked along the road, lowing as they went.” They were crying for their children and had probably developed chronic mastitis, but they chose to do God’s will. The story doesn’t end there. When the obedient, lovely, submissive cows arrived at their destination, they were unyoked. The cart was chopped up. They were offered as burnt offerings to God. Nice! They didn’t even get a chance to say goodbye to their kids. That was it. After all they had done. Not even a pat or a thank you. On the wood they went; a pleasing sacrifice to God. Next to Deborah, Ruth and Esther, these are my heroes. When I get to heaven, I want to sit at their feet and ask them how they did it.